シリーズ名： ? Japan Series ? Cross-cultural misunderstandings frequently appear in situations where Westerners interact with people from the Far East, in particular with the Japanese. 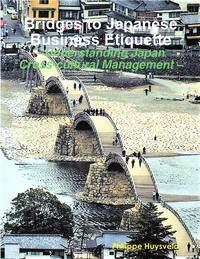 As a Japan Business Consultant, I have witnessed many business cases, situations or events, where understanding the basics of Japanese business etiquette and Japan cross-cultural management would have helped a lot. This book, filled with concrete advice and illustrations of what to do and what not to do, aims at giving foreign business executives the necessary background and “toolkit” for succeeding in their “Japan cross-cultural adventure”. After all, for curious and outward looking minds, this really could be fun! ?Non-Japanese business executives working for Japanese companies, either in Japan or abroad (in branches or subsidiaries established outside Japan). ?Non-Japanese business executives approaching or dealing with the Japanese Market. ?Non-Japanese business executives or foreign expatriates working for foreign companies established in Japan. ?Anyone with a real interest in communicating and interacting better with the Japanese in general. The reader equipped with all the tools and tips I have developed in this book should definitely “perform better” when confronted with a Japanese prospect, potential business partner or “boss”. Being well prepared for future Japan-related business opportunities is of the most importance now that an EPA in principle (Economic Partnership Agreement) has been concluded between the EU and Japan!